This year (2018) MomenTUm, the academic celebration of the year, was organized for the first time. 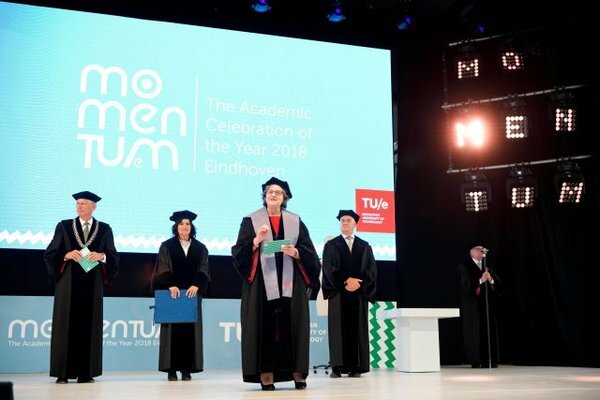 In it, the Dies Natalis, the presentation of honorary doctorates, the Academic Awards, the presentation of the Marina van Damme Grant and the Bachelor's diploma ceremonies were merged into a festive day, consisting of one major ceremony and a large party. Everyone was welcome: students and employees, but also parents, friends, alumni, relations and the people of Eindhoven. MomenTUm took place on Friday 21 September, which means that the Dies Natalis will not take place in April and that the other ceremonies mentioned will not be planned on the days they used to be planned.